Thomas Rhett is taking his “Life Changes Tour” to Canada in 2019 for nine dates. Kicking off on April 24 in Montreal, Rhett will make additional stops in Ottawa, Calgary, Vancouver and more. 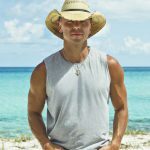 Dustin Lynch will serve as support. “My fans in Canada are incredible, so I’m really excited that we will be headed there for a couple weeks next year and get to bring all the energy of the Life Changes Tour with us,” said Thomas Rhett. Tickets for the Canadian leg of the “Life Change Tour” will go on sale on September 28.